So I really love the Pumpkin Scones that are available this time of year at Starbucks – I do not however like the impact they have on my wallet. A few bucks every time I pick up an afternoon coffee really starts to add up! This year I set out to find a Pumpkin Scone recipe that would be delicious, yet not cause me to drop those extra few dollars every time I go for a coffee run this fall. This recipe is a winner. It’s quite easy and the scones come out light and fluffy. I cannot vouch for healthiness – but really, doesn’t one mostly eat scones because they are good for the soul? These ones are particularly good for enjoying with afternoon tea by a warm fire. The first time I made these, I assembled the dough entirely in my food processor – which worked quite well indeed, particularly for ensuring even butter distribution. The second time just for kicks I tried making it in my stand mixer, which also came out quite well although I did have a few larger chunks of butter left over. It didn’t seem to affect the scones in any way though. I can honestly recommend both manners of constructing these scones. I also will emphasize the importance of baking on parchment – this prevented the scones from caramelizing on the bottom. I really didn’t make any major substitutions the first time, except for leaving out cloves and ginger again (darn it, I really need to pick up ground ginger! 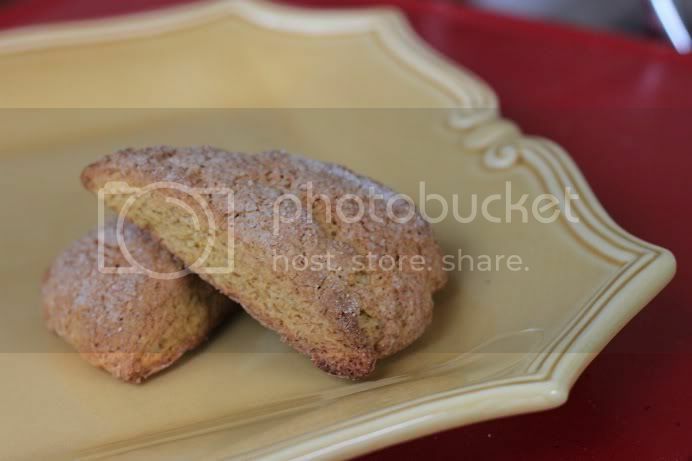 ), and also completely eliminating the glaze as I prefer my scones to be not quite so sugary. I also added chocolate chips, because who does not like chocolate chips! The second time, I realized I didn’t have any half and half, milk, or cream on hand – so I ended up using non-dairy flavored coffee creamer (this one happened to be caramel) which added a little extra something to the flavor. The texture still was perfect. Also, I was going for more of a breakfasty treat this time, so left out the chocolate chips. Don’t be afraid to experiment! We would love to hear about a modification you try to one of these recipes. Preheat oven to 425 degrees F. Mix dry ingredients (flour, sugar, baking powder, salt and spices) together the bowl of your stand mixer (or food processor – or really any large bowl if you would rather do this by hand!) Mix dry ingredients well. Add cubed cold butter to the dry ingredients and turn on your stand mixer/food processor (or use a pastry cutter to cut the butter into the dry ingrediends by hand) until the butter is broken into small pieces and the mixture resembles the texture of cornmeal. In a separate bowl, whisk together pumpkin, egg, and milk (or whatever substitute you pick). Gently fold the liquid ingredients into the dry ingredients. (The key to flaky light scones is not overworking the dough; I used the food processor for this step the first time and they came out fine, and I used the stand mixer on low for this step the second time.) Turn the dough out onto a lightly floured surface and pat into a 2 x 6-8inch diameter circles of dough, about 1 inch thick. Cut each circle of dough into 8 pieces. Place on a parchment-lined baking sheet. Brush each scone with a light coating of milk (or whatever substitute you pick) and sprinkle lightly with sugar. Bake at 425 degrees F for about 12-14 minutes, or until the tops are lightly browned. Enjoy!